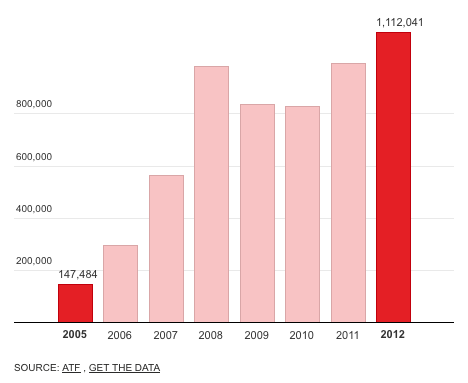 If you want to find out exactly how many guns are sold in the US each year, then the figures are not recorded. 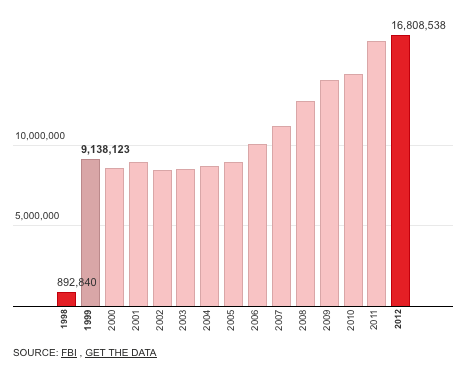 However, if you want to know how many applications there are to buy guns each year, then the latest data from the FBI shows that 2012 looks like a bumper year for gun sales in America. In the wake of the Newtown shooting in Connecticut, there is a renewed focus on gun control in the US. And, under US law, the National Instant Criminal Background Check System is used to check if someone can buy a gun from a federal registered dealer before they can walk out of the shop with it. Before ringing up the sale, cashiers call in a check to the FBI or to other designated agencies to ensure that each customer does not have a criminal record or isn't otherwise ineligible to make a purchase. The figures show that there have been 16,808,538 applications in 2012 so far to the end of November. If they were approved, that would be enough weapons to stock a member of Nato's armed forces nearly five times over. The system has received 156,577,260 applications since 1998 and the US has the highest gun ownership rate in the world. 68,584,078 of the total applications since 1998 have been for 'long guns' such as rifles, usually a minimum length of 16 inches (40 cm) for rifle barrels — that is 43.8% of all applications. 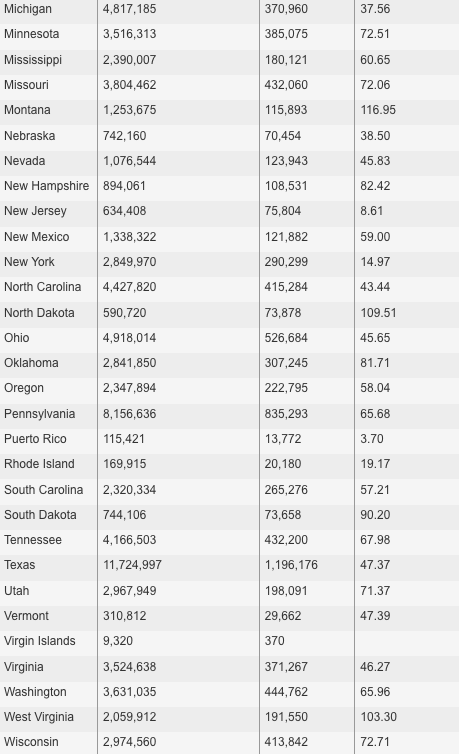 The figures are also broken down by state — and they show that of those 16.8m applications, a huge amount come from Kentucky: 2,329,151, followed by Texas with 1,196,176 applications. 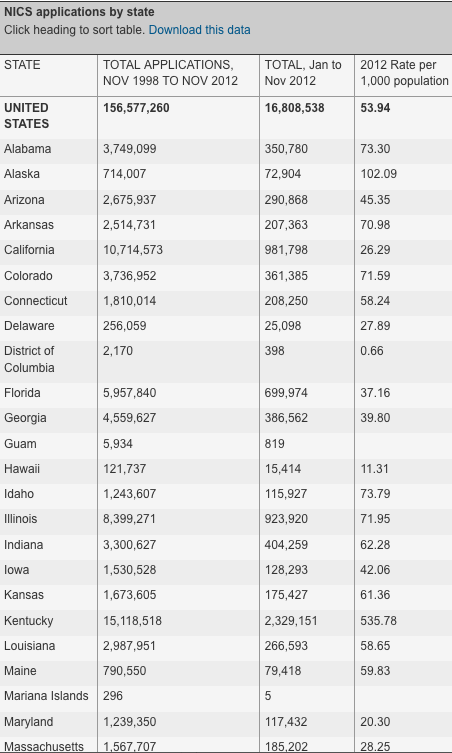 If you look at those figures by population for 2012, then Kentucky has had 535.78 applications for every 1,000 people in the state, followed by Montana with 116.95. The US average for 2012 is 53.94. Of course, not all applications are approved. Reasons for denial include being convicted of a crime in the last two years, having a dishonorable discharge from the military or mental health problems. The latest figures show that being convicted of a crime (which is the easiest to check after all) is responsible for 58.65% of the 976,255 denials under the system. The Bureau of Alcohol, Tobacco, Firearms and Explosives also records figures for weapons stocked under the National Firearms act, which regulates and taxes many of the most serious weapons. It shows a record high in these weapons being processed this year. The full data is below. What have we missed and what can you add?